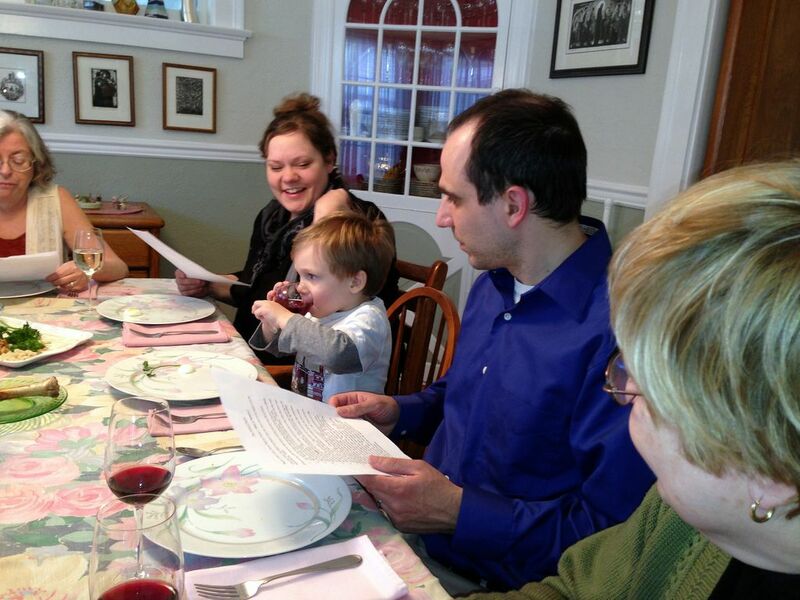 When our kids were young we joined with close friends who also had two kids in the same age bracket and started a yearly tradition of holding a Passover meal coupled with a Christian communion service. The Passover meal is considered to be the meal celebrated with Jesus and his Apostles on Holy Thursday. Celebrating the Passover traditions and coupling it with Christian rituals is an enriching experience for people in the Christian tradition and connects us to our Jewish roots. Our children always enjoyed this special evening but we haven’t done it in a long time. Two of our daughters, now both 32 years old and married with young boys were interested in doing this again. The grandparents – on both sides – felt great that the girls remembered this so fondly and wanted their children to experience it but we were concerned about how it would work with a 2 (James) and 3 (Zach) year old. 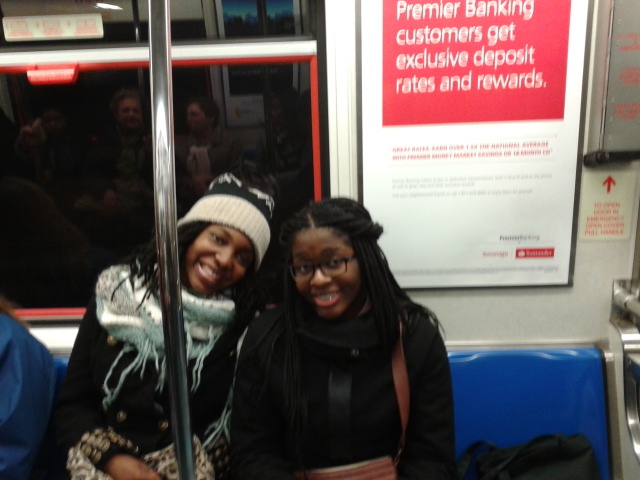 We liked the idea and decided to proceed cautiously and be flexible. Fortunately, the other grandmother, Joan, was a Kindergarten teacher for over 25 years and had resources and a good sense of what would work. Joan had a Passover flap book and she put together a script for the meal and ceremony using this book and other resources. We gathered at our house at 4 PM. It was the first time the boys were meeting each other and they had some play time together. 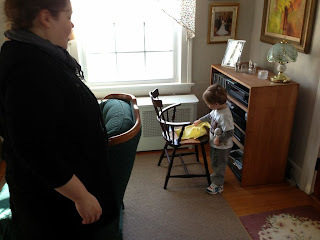 Then we went to the living room and each family of three generations sat together. 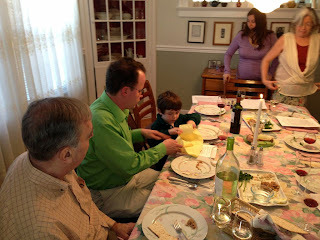 Joan read the Passover book and each boy took turns opening the flaps. They sat and listened attentively. 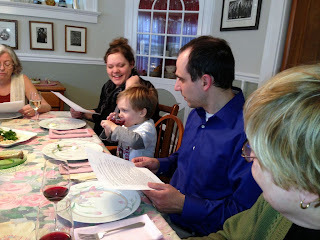 Then we went to the dining room table for our own Passover. The adults had the script and we took turns reading. 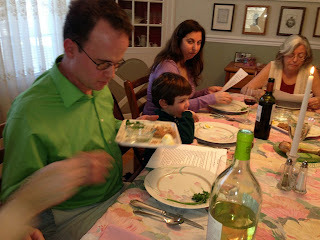 The table had two platters with the Passover foods. The boys had small wine glasses with cranberry juice and the adults had wine. As we described each food the boys had a chance to sample the various foods. James especially liked the parsley dipped in salt water and Zach like chopped apples/nuts that James’ grandfather had made. They drank their juice as we drank our wine. Both boys went together to open the front door. And they each found an afikomen hidden in the living room. After the Passover service, we enjoyed a family meal together – two families – now three generations together. Bonding in a special way and as Joan says – there were so many modalities for learning for the boys – listen, touch, smell and taste. This was such a wonderful experience for our families - I really can't overrate it. I am so glad that we started this 25 years ago and re-initiated it last weekend. 10 people, 2 families, 3 generations celebrating and enjoying a religious and historically cultural experience together. Joan made it PERFECT. She knew exactly the way to engage two young children and make them enjoy and be an integral part of this experience. I am writing this today to encourage you to adapt your religious and spiritual rituals for the young children in your families and to establish traditions. I am a tradition buff – but always willing to adapt them to new realities of life. The grandparents in this group were surprised but proud and elated that our kids wanted to pass on the tradition that we started with them and I wish you well with your own traditions. Please share them in the comments. Spring will be here soon and we all will be looking for some new and interesting toys for the season. In our family that also means finding something interesting for Easter baskets. I am a fan of Easter baskets without too much candy. I always put a great deal of thought into this for my kids and now I am thinking about it for my grandson, Zach who is almost four years old. In the recent past there have been Trash Pack eggs and a Dinosaur Train egg that had to be left in water and Buddy emerged after a few days. Zach loved both of these. This year my “Easter Basket” giveaway is great for a very young child and as I learned from my grandson, Zach, three year olds like it too. I saw the Peek ‘n Peep Eggs by KidOozie at Toy Fair in NY in February at the International Playthings booth. I immediately knew it would be my favorite for an Easter Basket idea giveaway. This is my third year for such a giveaway so I guess it’s a feature of The Grandma Chronicles now. This cute, compact, inexpensive toy has a lot going for it. The package says 12 months plus, but I think any child who can sit up will enjoy it and so will four year olds. The package wisely has a picture of the toy and not a child so it doesn’t scream that it is for a certain age. Here’s the description that my pictures help describe better than my words can. It is a bright yellow, pliable six pack egg carton with faces peeking through the top. Each egg shell opens to a colorful egg which squeaks when you press it. Each egg has a different shape bottom so it only fits in one space properly. A young child can enjoy the colors and hearing the sounds and then fitting the top shell on just right. An older child learns the shapes by fitting the eggs into the right holes and enjoy counting the eggs. Three and four year olds will want to match the facial expressions of the colored eggs with the white shells. This was easy for my grandson but he enjoyed the multilevel matching aspects of the Peek n’ Peep Eggs. 1) No batteries! This simple toy does not light up or talk and sing, but it will hold the attention of children because of its simple challenges and ability to master it. 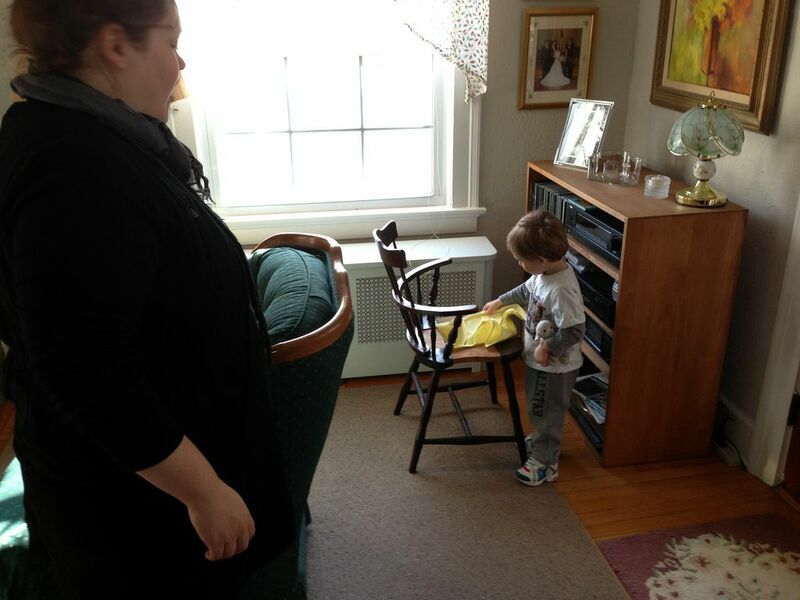 2) It’s lightweight and easily thrown in the bag going to Grandma’s house. Or if you keep it at your house, it’s compact and easy to store. 3) It’s cute – grandparents love cute. So… I highly recommend finding non candy things for your Easter baskets. This is especially important for very young children. And they really do have enough plush animals – really. Peek ‘n Peep Eggs is a great item to feature in your holiday celebration – even if you don’t celebrate Easter. 1 Leave a comment here on the blog and email me with your email address at marion@grandmachronicles.com. I will not use your email address for anything except to notify you if you win. Grandmother’s Honor. 2 Like The Grandma Chronicles facebook page here. If you do both, you will have two entries. Deadline to enter: March 21, 2013 at midnight. The winner will be selected using random.org. Full Disclosure: I received a complimentary Peek ‘n Peep Eggs. This review is completely my own opinion and I was not reimbursed for it. Check these non candy ideas at Amazon.